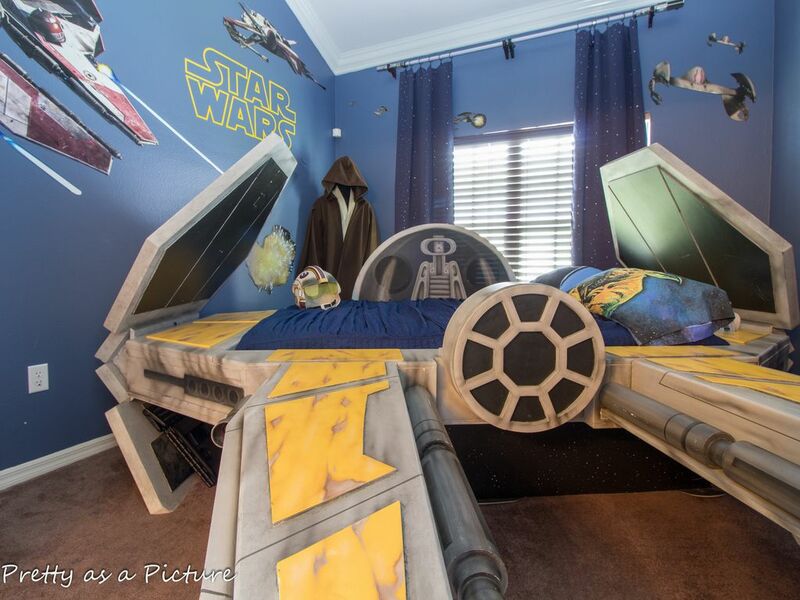 4 King Beds PLUS Harry Potter Theater, Star Wars, Moana, Frozen. Disney 2 miles! 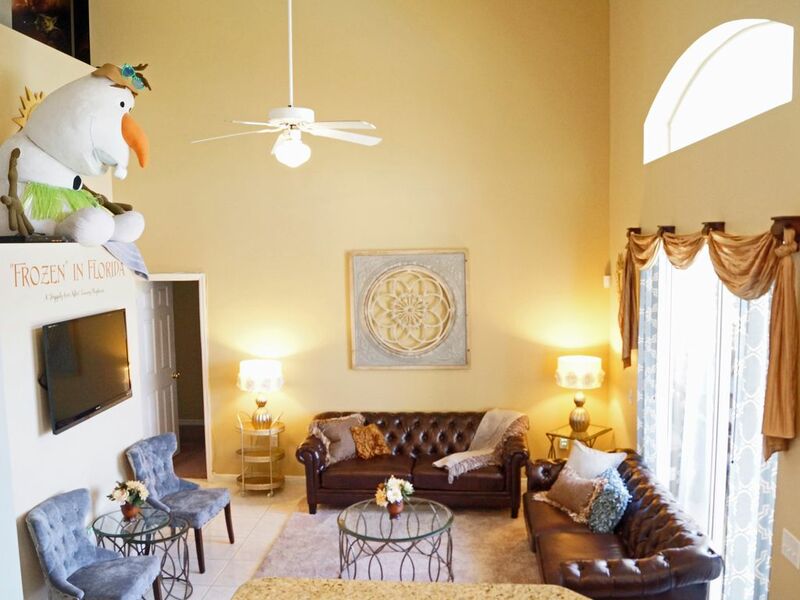 As a recent guest described it, we "have the best homes for kids in Orlando"!!! (Yes, your many hours of hunting down the perfect vacation property are finally over! 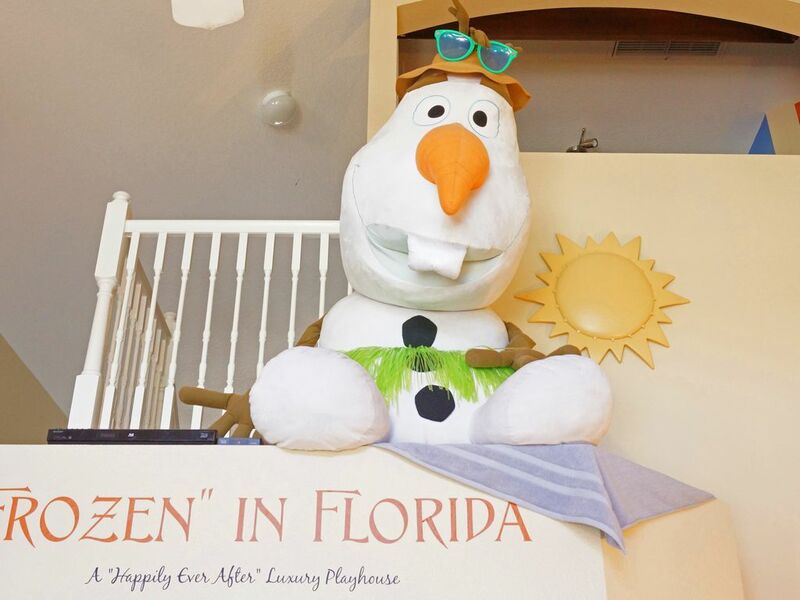 Our guests prefer our property over the Disney Resorts, too!) This luxurious playhouse is worth the trip itself, for both kids AND adults!!! 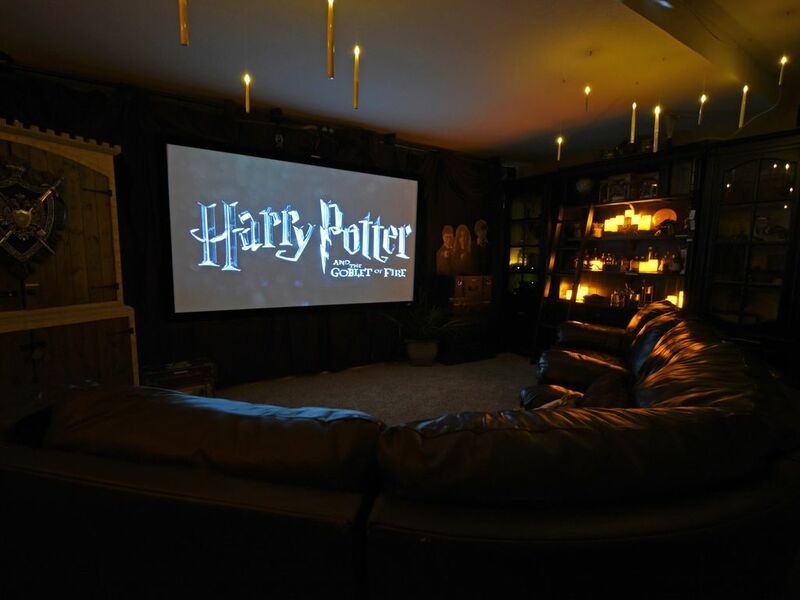 Four luxurious King Master Bedrooms (three of which are suites with access to adjoining kids' rooms and/or gorgeous custom bathrooms); Unbelievable Harry Potter Home Theater with 8 ft screen, 3D projector, 200+ family-friendly 3D/blu-ray/DVD movies; Playstation 4 and more than a dozen popular family video games; decked out STAR WARS, MOANA /MAUI, FROZEN, and other PRINCESS rooms AND all the corresponding Disney/Universal cosplay dress-ups with accessories (sized infant to adult), toy figures, and board games you can imagine!!! 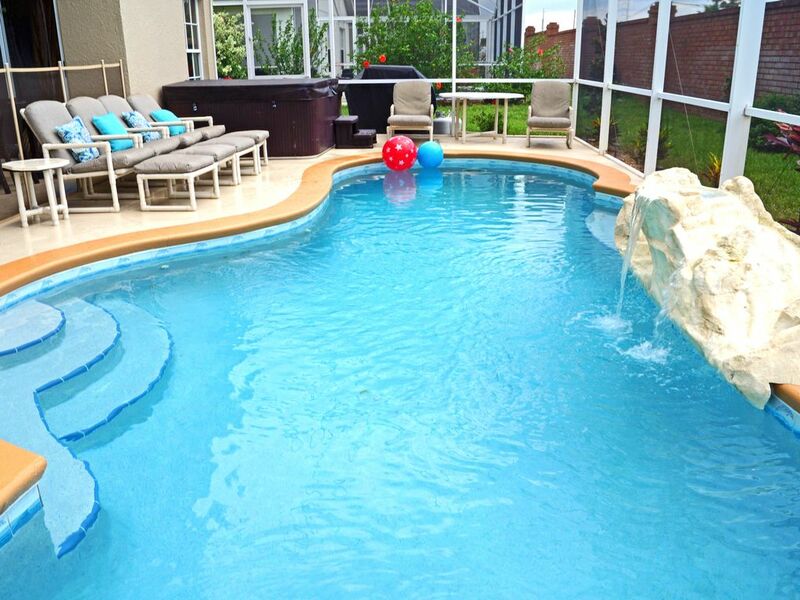 Gorgeous (and always heated) Waterfall Pool with separate Hot Tub that seats the whole family! The fun doesn't end at the parks; this home is a dream vacation in itself! At ONLY FIVE MINUTES (2+ miles!!!) from Disney's Main Gate, 'Happily Ever After' vacation villa is the perfect mid-day getaway from the parks, or play-day, all-day, at home! You may never want to leave!!! 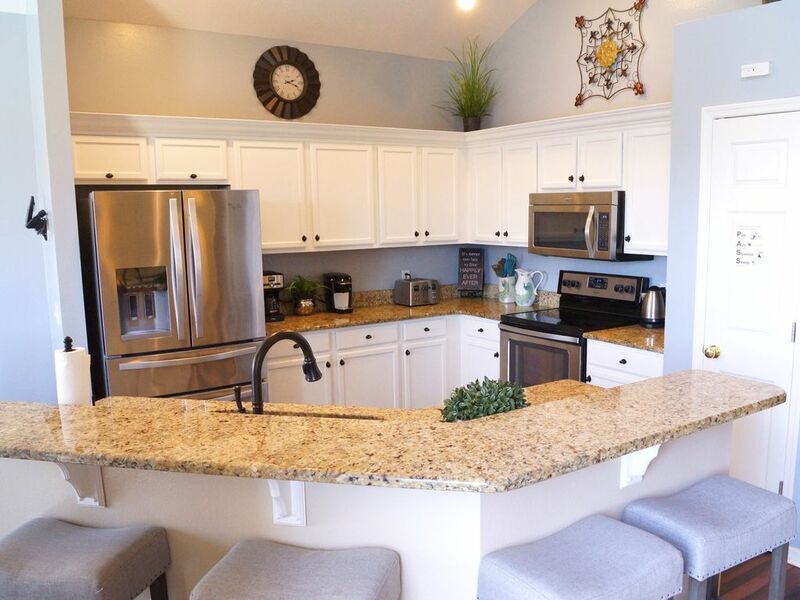 MAIN LEVEL FLOOR PLAN: __________________________ The layout of this 3,200 sq ft sunny, bright villa is the best available in the Disney area! 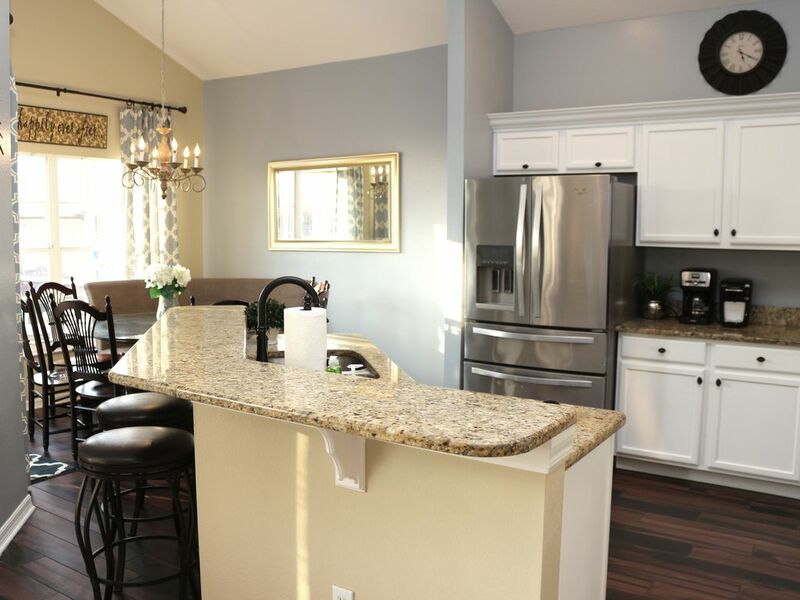 The family room, kitchen, and breakfast nook are open, forming a great gathering area for families and friends. 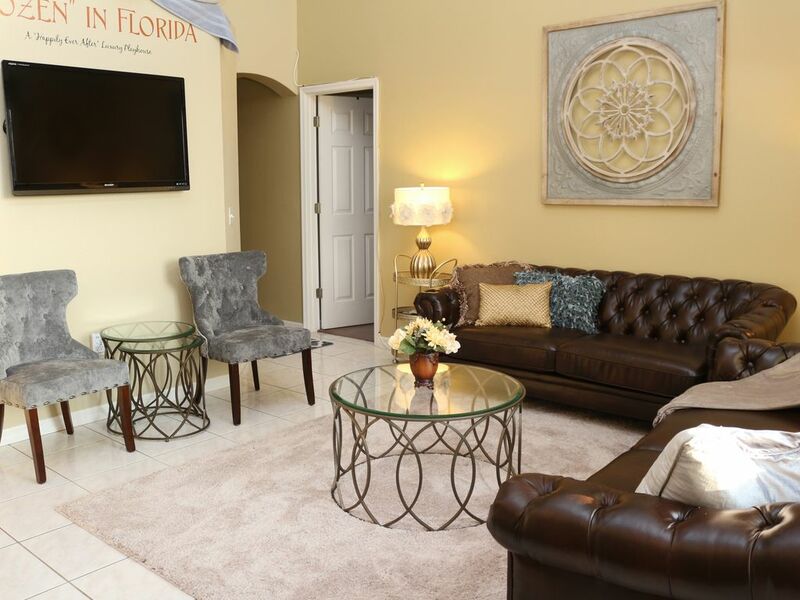 The main level is vaulted with tall ceilings and large windows to welcome the fantastic Florida sun! Three family suites with private bathrooms keep kids and parents nearby one another at night, but still optionally separated by doors for some getaway privacy!!! 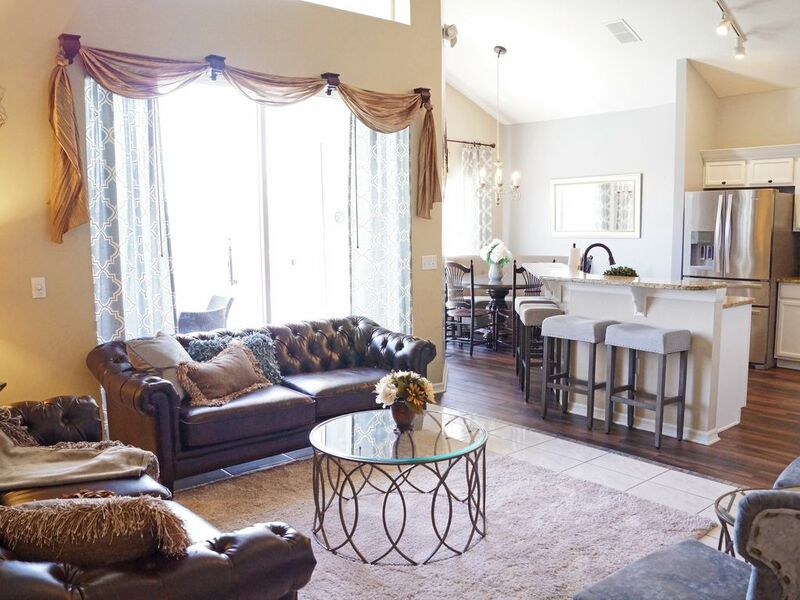 ***FAMILY GREAT ROOM with two button-tufted leather sofas, two side chairs, & end tables. Large 60 inch Sony Bravia TV with Roku and Blu-ray. FREE WIFI! FREE LOCAL AND LONG DISTANCE CALLS TO USA AND CANADA. All TVs (there are 5 total!!!) have Cable. ***FULLY STOCKED KITCHEN -- with china dinnerware for 24 guests (don't worry, we have Disney- themed plastic ware for kids! ), ample cookware for the range and microwave, a large family toaster and an additional Star Wars Darth Vader toaster, Ninja blender, Mr. Coffee maker, Keurig coffee maker, hand mixer, 8.5 qt Crock-Pot, family-sized griddle, rice maker, FIVE Disney waffle irons (Mickey Mouse, Princess, and Frozen's 'Olaf', Star Wars), etc. 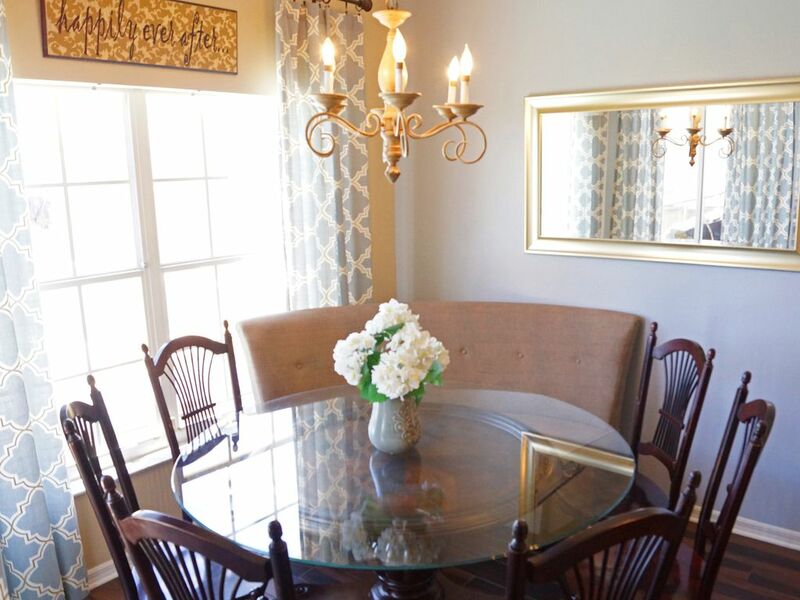 Round eat-in kitchen breakfast table seats 8-10, with 5 more at the breakfast bar. Has 1 high chair and 2 kids' dining boosters. 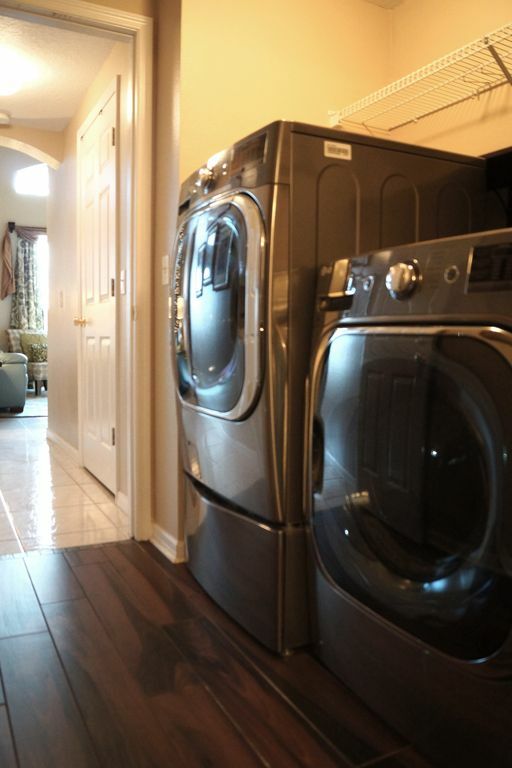 ***LAUNDRY ROOM boasts gigantic 5.2 cu ft, top-of-the-line, front-load washer and 1 cu ft drawer "sidekick" washer and front-load dryer, with a second dryer in the media room, ensuring your time at the villa is spent playing; not laundering load after load of clothes and beach towels! Ironing board and iron. 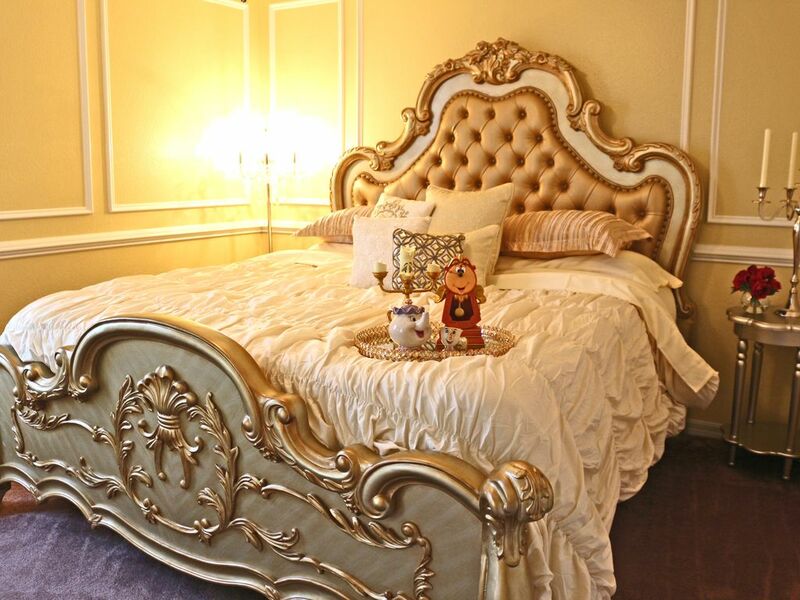 ***'CINDERELLA' at MIDNIGHT FAMILY/ KING MASTER BEDROOM SUITE with luxurious King bed, crystal chandelier/ceiling fan, gorgeous dresser, side tables, and tall storage wardrobe for clothing. 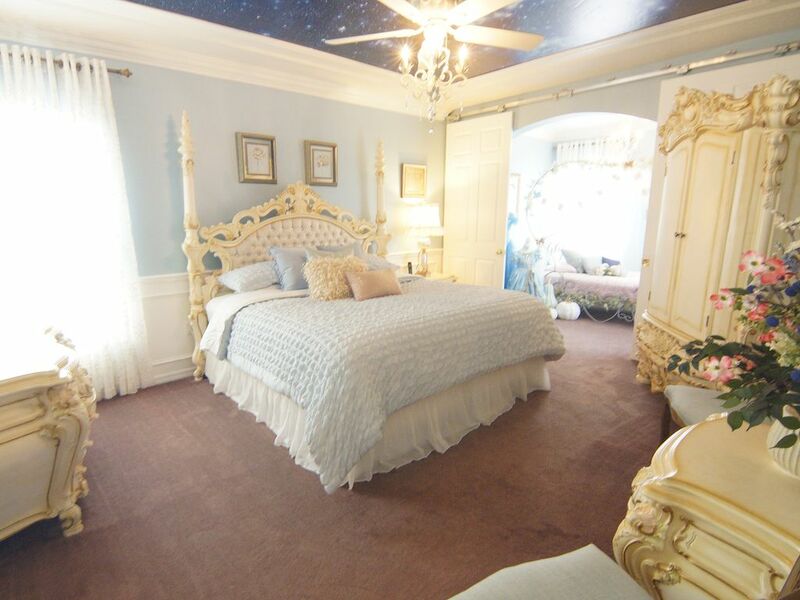 Also within this suite is the elegant Cinderella Carriage Bedroom with a twin-sized princess carriage bed [Optionally, barn-style doors can lock off these two rooms from one another], and a large master walk-in closet with a full-sized baby crib. 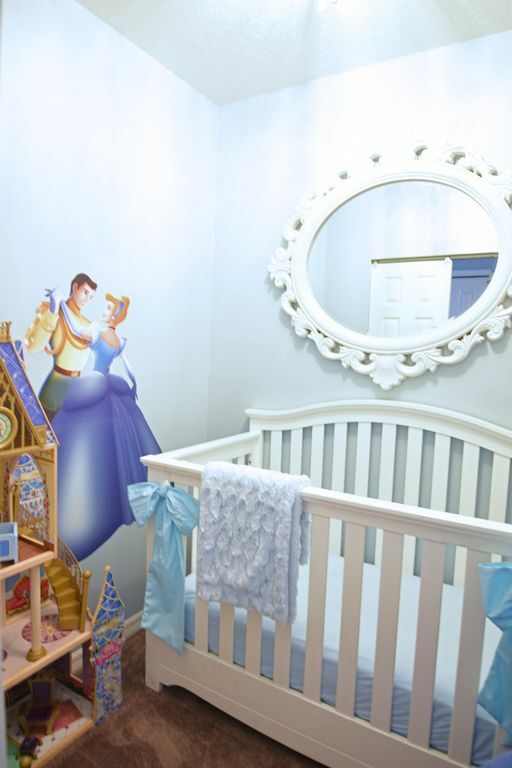 Gorgeous Cinderella gowns of all sizes, toddler to adult, will be the hit of the group...don't forget to pose for photos in front of this amazing Cinderella scene! 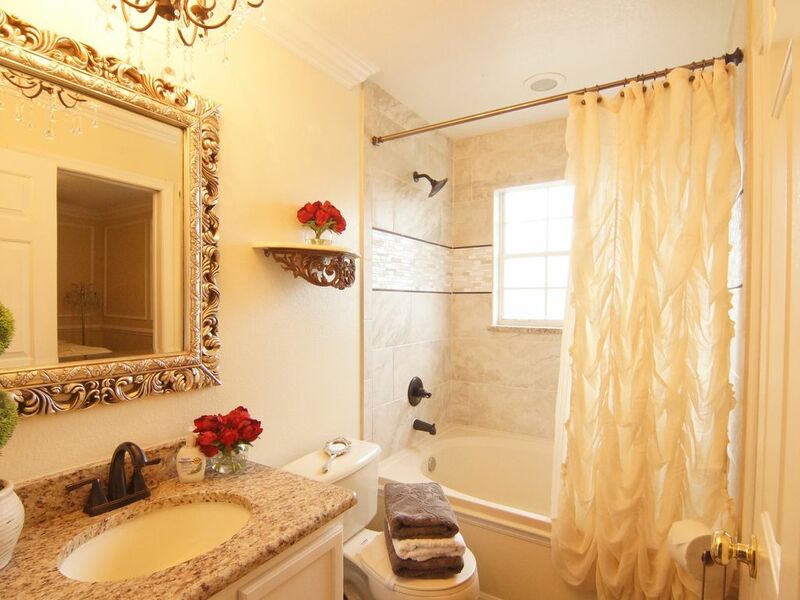 Cinderella's regal and elegant style reigns in this, the largest Ensuite Master Bathroom with huge crystal, gorgeous granite vanity, double sinks, & over-sized walk-in shower with custom tile! 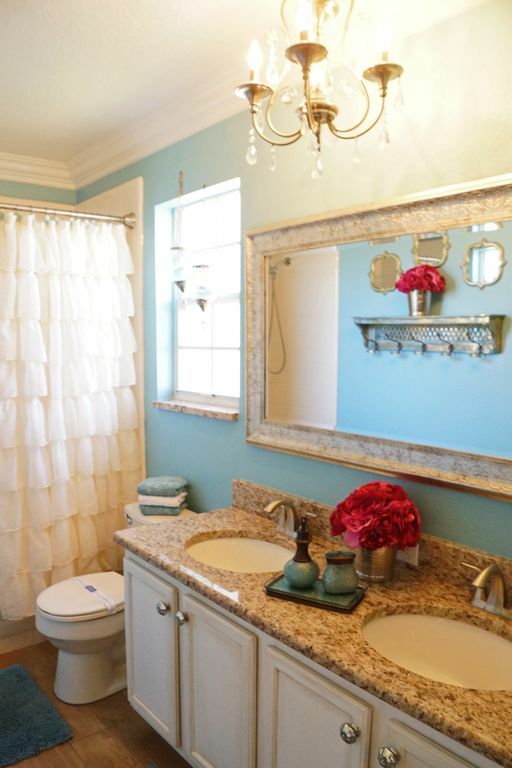 (Each bathroom also has a hairdryer, and the 105-gallon water heater means everyone gets a hot shower!!!) 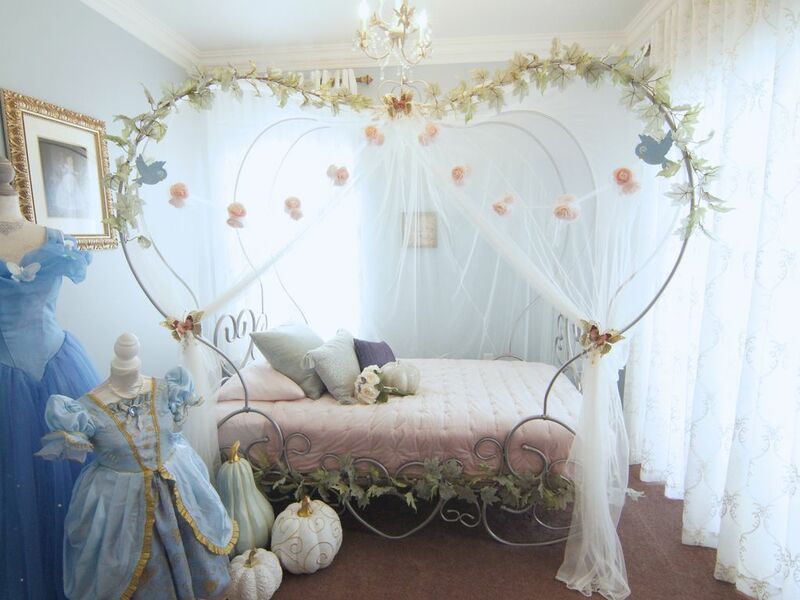 May all your childhood dreams come true in this fairytale suite! 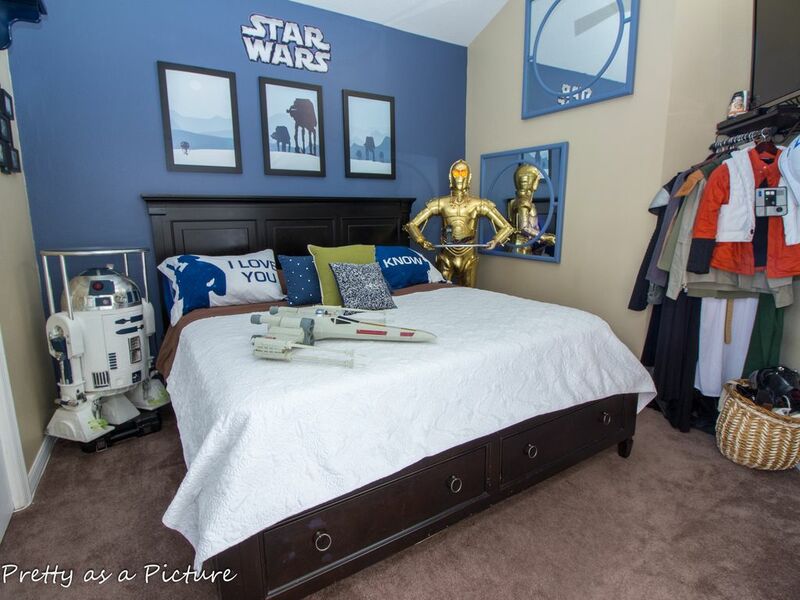 *** 'STAR WARS' FAMILY KING MASTER BEDROOM & ANAKIN SKYWALKER JEDI STARFIGHTER BEDROOM with King-sized bed and Star Wars droid side service tables! 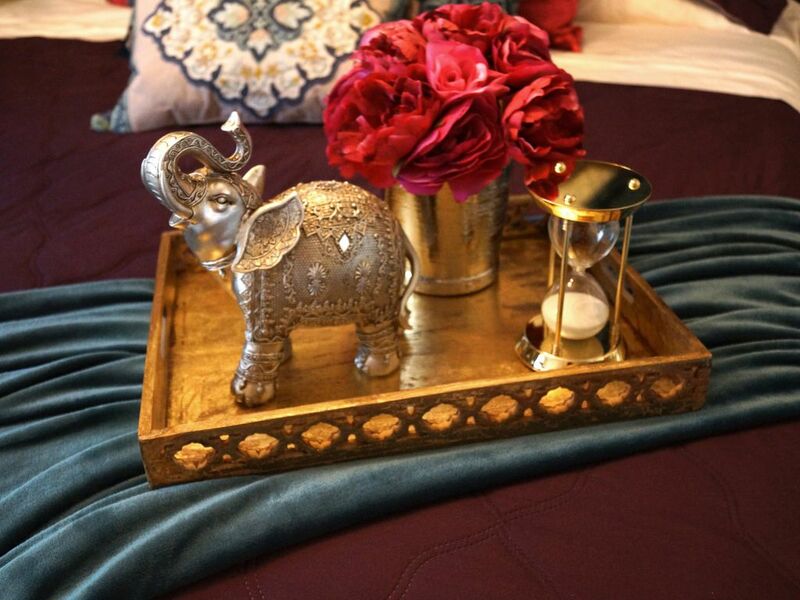 The King bed has large drawers for storing clothing. A huge, 47 inch Sharp Aquos TV, Roku, Cable, and Blu-ray are mounted on the wall of the space-age King bedroom! 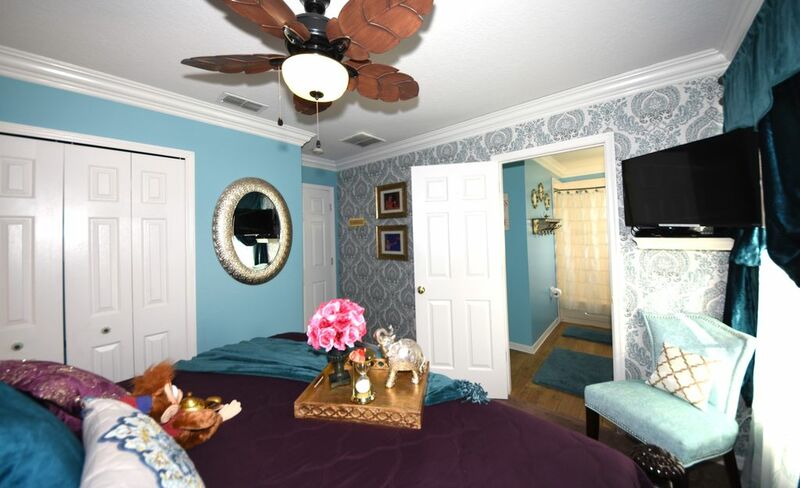 Both rooms have ceiling fans. 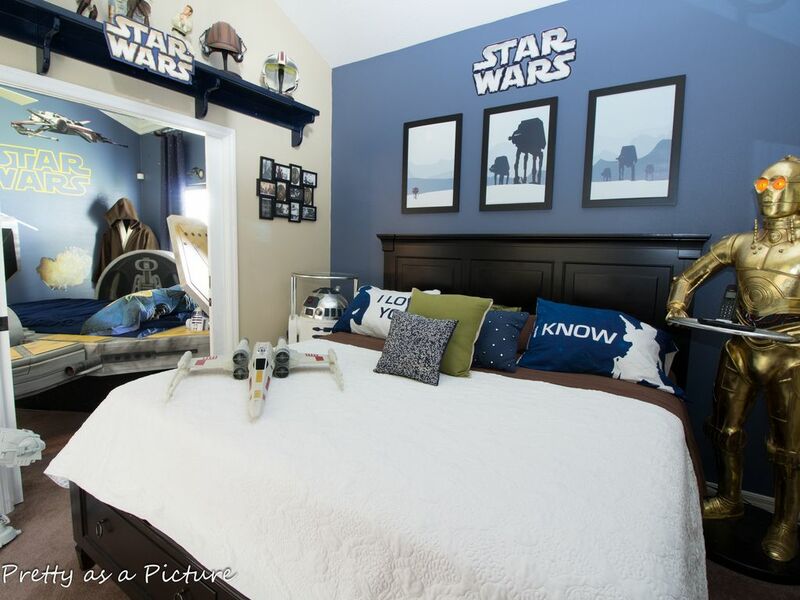 The "Force" is very strong between these two space-aged bedrooms, with private access to one another through an optionally closing/locking pocket door between them! 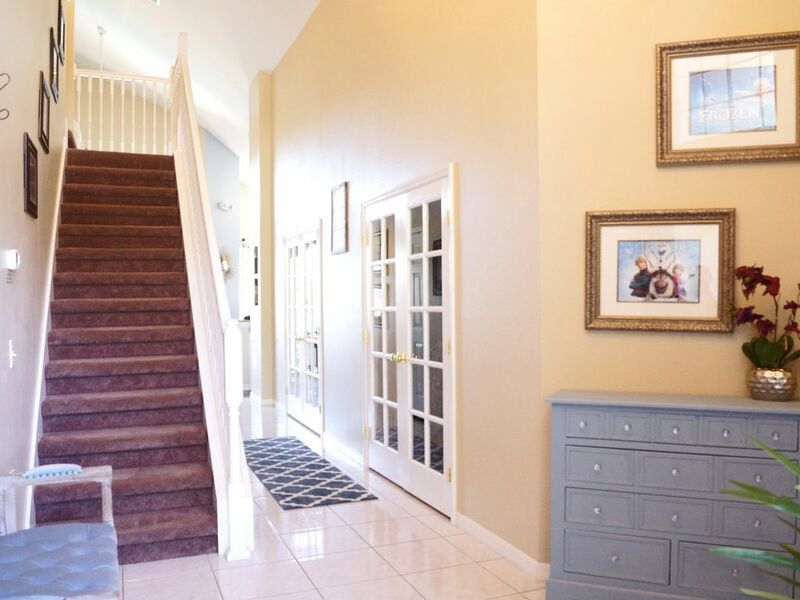 [Both rooms also have hallway access.] 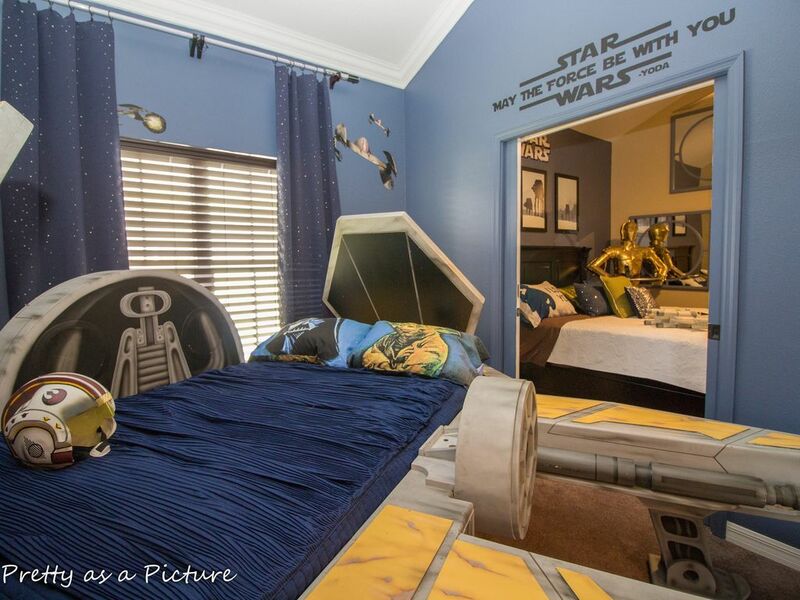 The double/full-sized (sleeps 2) Starfighter bed is crazy fun for Jedi protecting the galaxy. 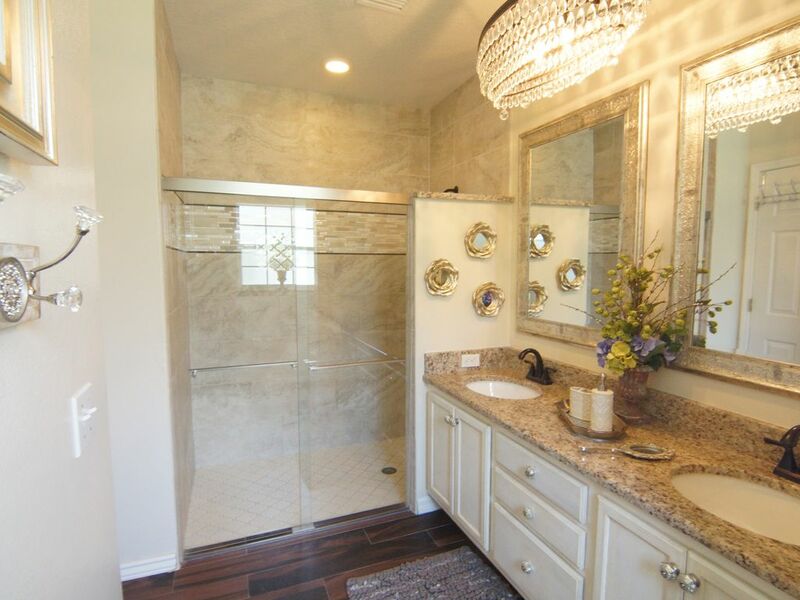 This is the only King Master that has its newly remodeled bathroom 3 steps into the hall (not within the bedroom). 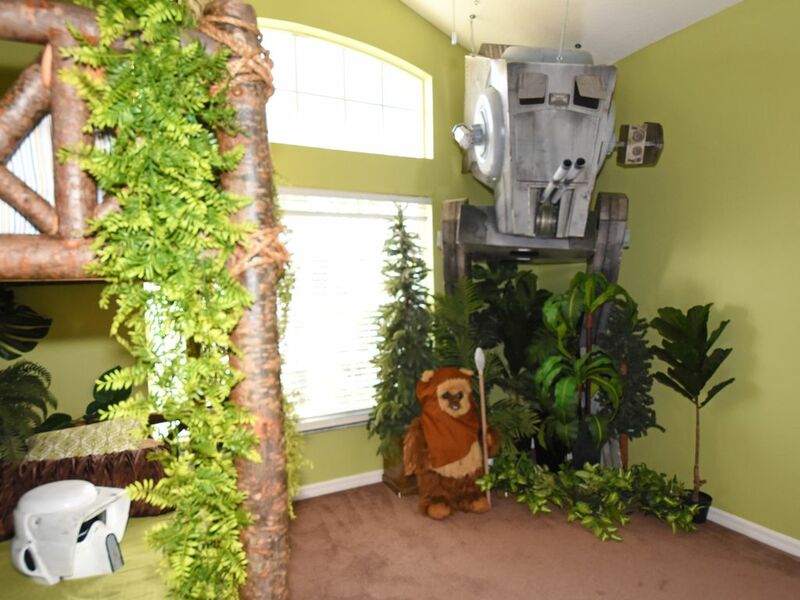 ***'STAR WARS' EWOKS ON PLANET ENDOR BEDROOM: The mammoth-sized Imperial AT-ST Chicken Walker threaten these adorable, life-sized Ewoks! 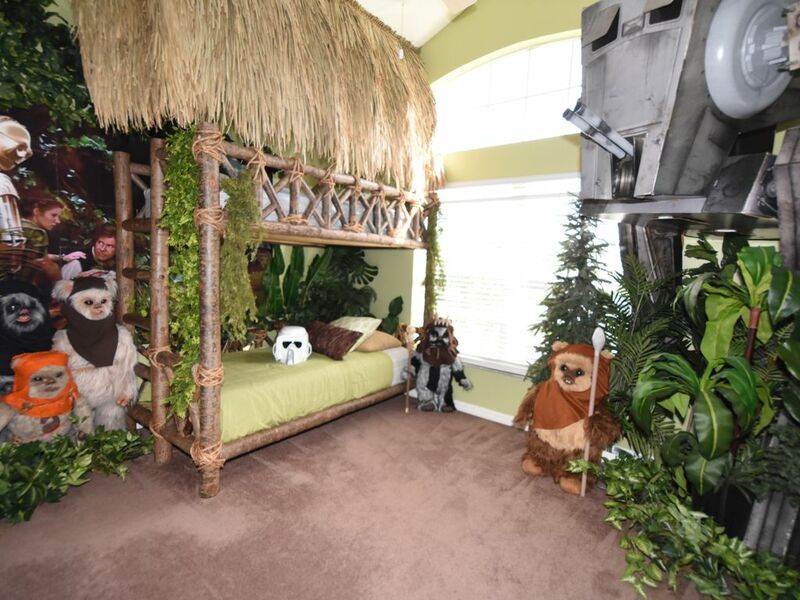 Two twin beds are camouflaged by the foliage and treehouse hut from which the Ewoks battle the Dark Side troops. Kids will love to throw on a Cosplay-quality costume, grab a light saber or blaster, and join the battle with the Ewoks, or maybe even fight 'Darth Dad' if he'll suit up for a photo with the kids! Tons of fun toy Star Wars ships and figures will keep your Jedi busy playing for many hours. 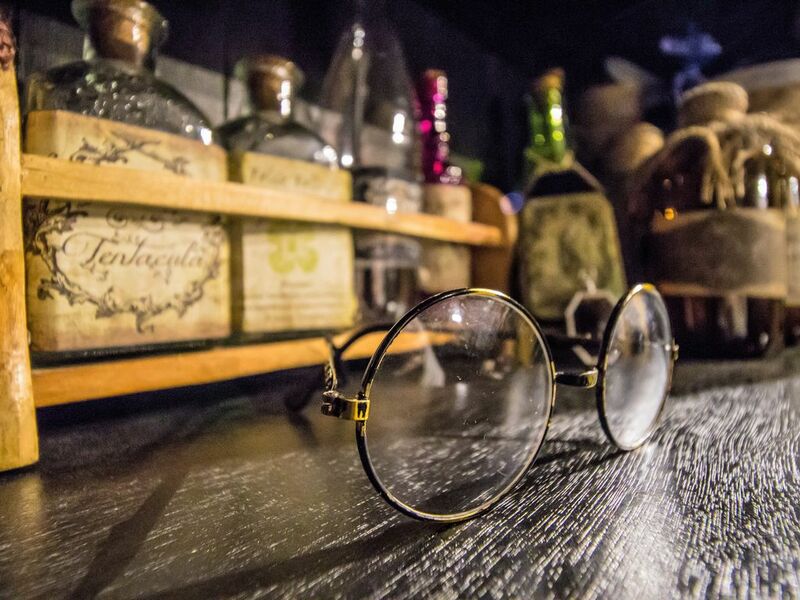 His time in this room may be his favorite memories of this special trip! 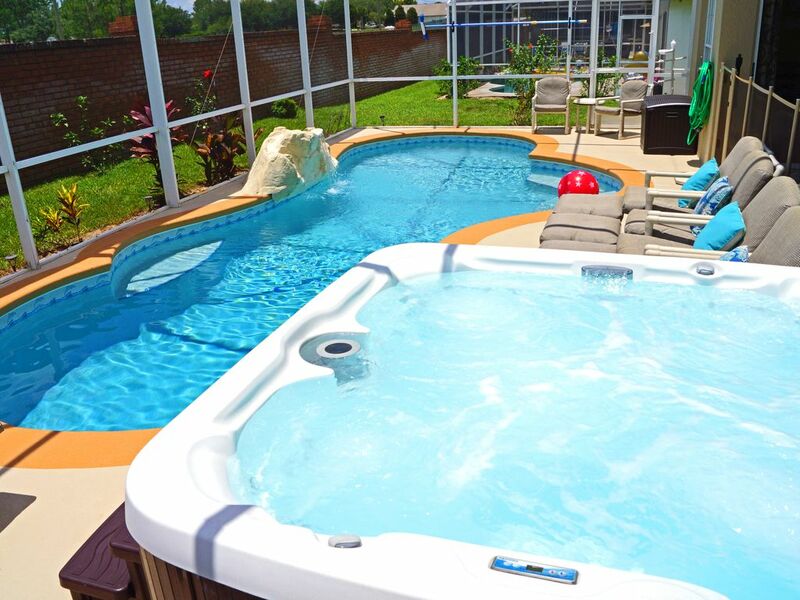 And the kids will love it, too ;-) ***ALWAYS HEATED, CRYSTAL-BLUE POOL with two built-in seating areas and separate always heated Hot Tub! Heating on Hot Tub and Pool are always included FREE!!! 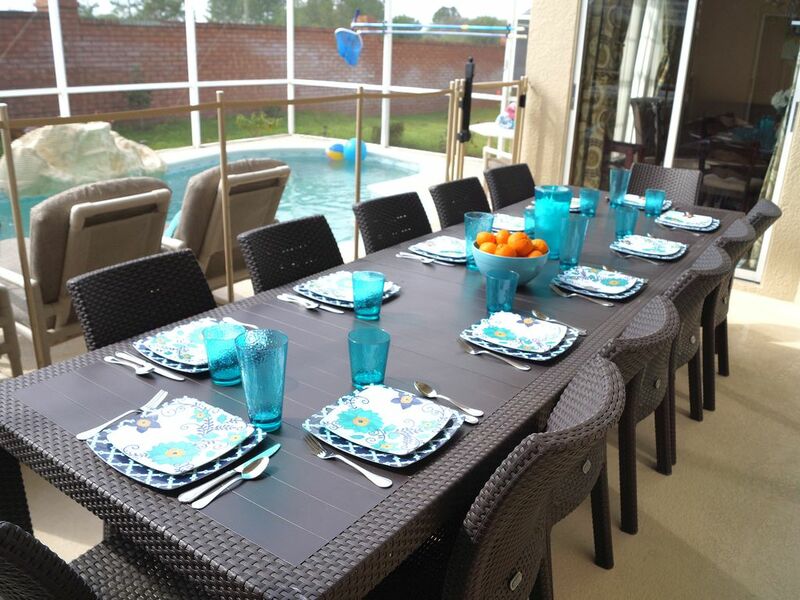 Covered lanai and huge outdoor dining table and chairs seats 12!!! 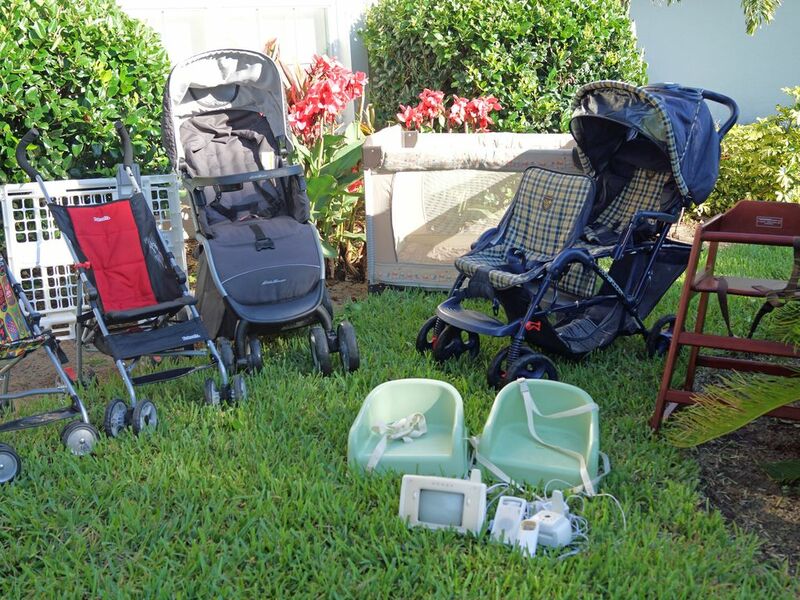 Plus, 6 chaise lounge chairs, 2 side chairs, and FREE use of the propane gas BBQ/grill. 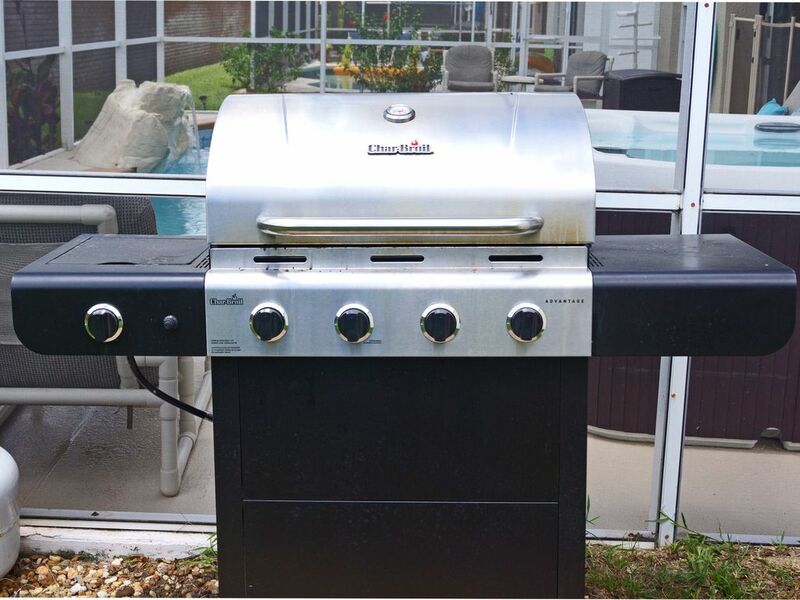 A second charcoal grill is also FREE (we do not provide charcoal). Removable, locking child safety fence surrounds pool. Pool toys and toddler/infant life jackets are available and complimentary. Home interior doors are also equipped with child safety locks and alarms (this villa has been named "Fort Knox" by many a guest for its many security features to the pool). 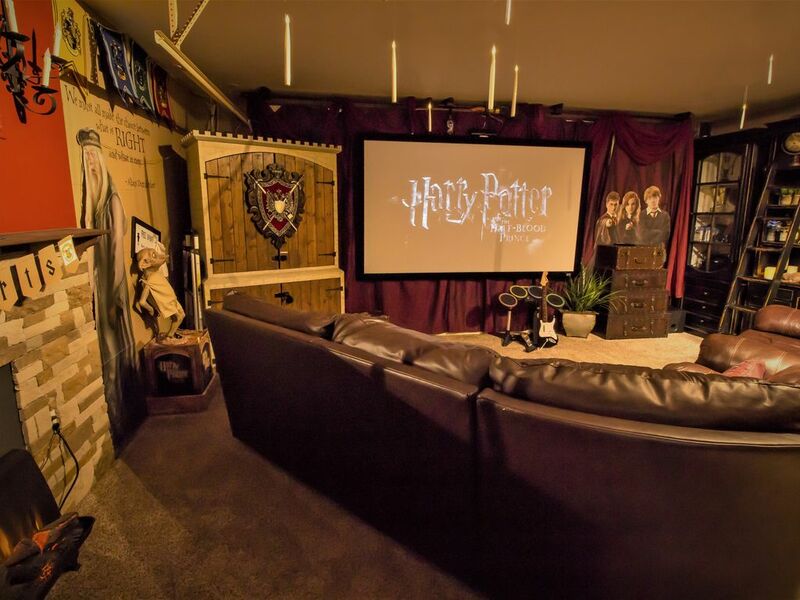 ***SPECTACULAR HARRY POTTER THEATER ROOM with Huge 8 foot Movie screen and projector (3D capabilities), and immersive stereo system. 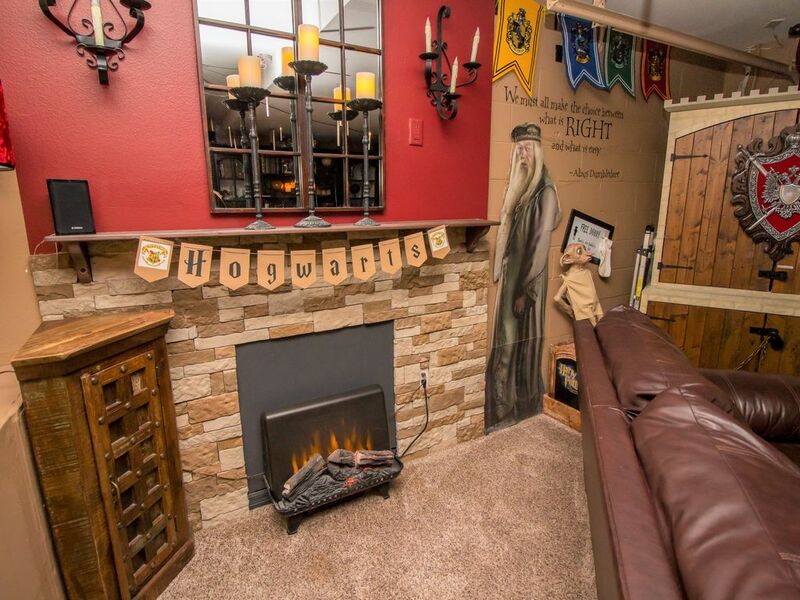 Hogwarts Castle Bunkbed (sleeps 4...double/full over double/full) and double/full-sized Pull-out Sofabed sleeps up to 6 in this fabulous room! Playstation 4 with more than a dozen games, including Lego, NBA Basketball, Fifa Soccer, Madden Football, several Just Dance, Singstar Karaoke, and Disney Infinity with a loads of Infinity characters! Smart Blu-ray/DVD with apps; complimentary family movie collection of 200+ of the best DVD and Blu-ray films-- includes both old favorites and new releases (dozens of Disney and Pixar, Harry Potter, Star Wars, etc., including several dozen in 3D blu-ray!!! 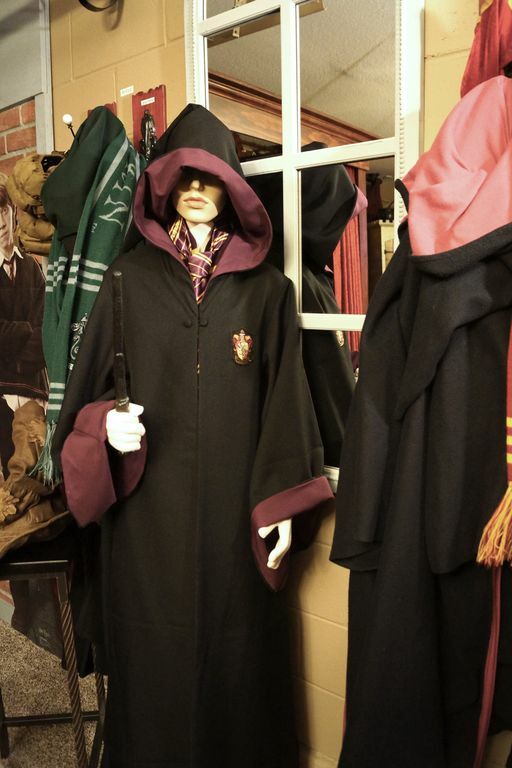 ); toys such as Harry Potter action figures and Hogwarts play castle; and loads of Harry Potter dress-ups/cosplay robes from Universal Studios theme park (sized preschool to adult), wands, and accessories for keeping this Hogwarts Gryffindor room safe! 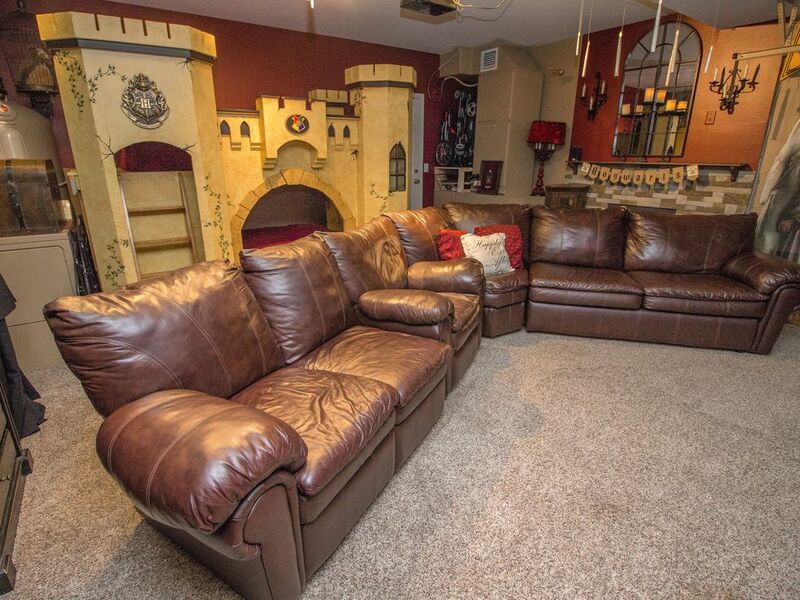 This media room is the ULTIMATE PLAYPLACE!!! We DARE you to be bored here! UPPER/2ND STORY LEVEL FLOOR PLAN: _______________________________________ ***BELLE'S KING MASTER BEDROOM with beautiful, sleigh-style king bed with crystal button-tufting and two end tables. 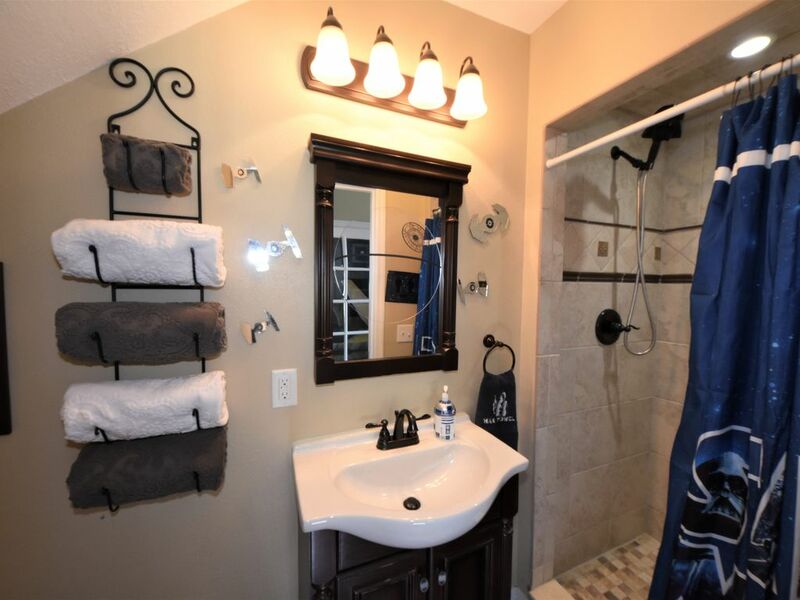 Elegant, ensuite Master Bathroom with granite vanity, over-sized bathtub, and custom-tile shower (this bathroom has optional access from the "Frozen Fever" Hallway Loft!). Ceiling fan, 32 in. flat screen TV, Roku, and Blu-ray. 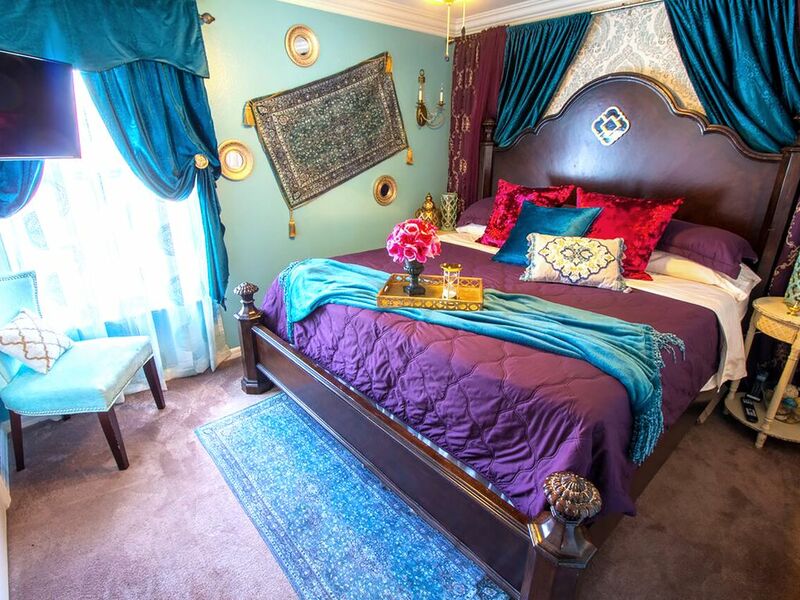 ***Disney's Jasmine ("Aladdin") KING MASTER BEDROOM SUITE with oversized, elegant king bed and Moroccan side tables. Ceiling fan, 32 inch flat screen TV, Roku, & Blu-ray. Ensuite Master Jasmine Bathroom with double sinks on gorgeous granite vanity, and shower/bathtub combo (also has optional jack-and-jill access from the Maui & Moana bedroom). 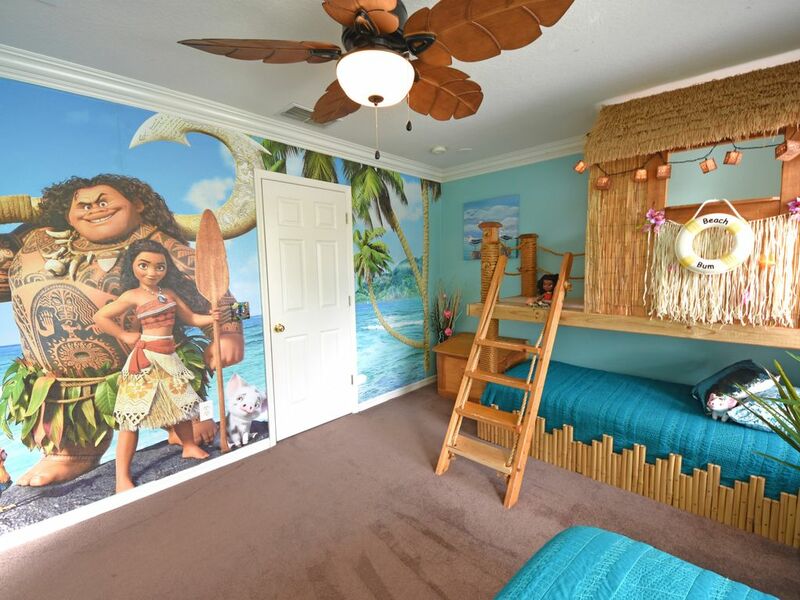 ***MAUI & 'MOANA' ocean bedroom with Play Tiki Hut! 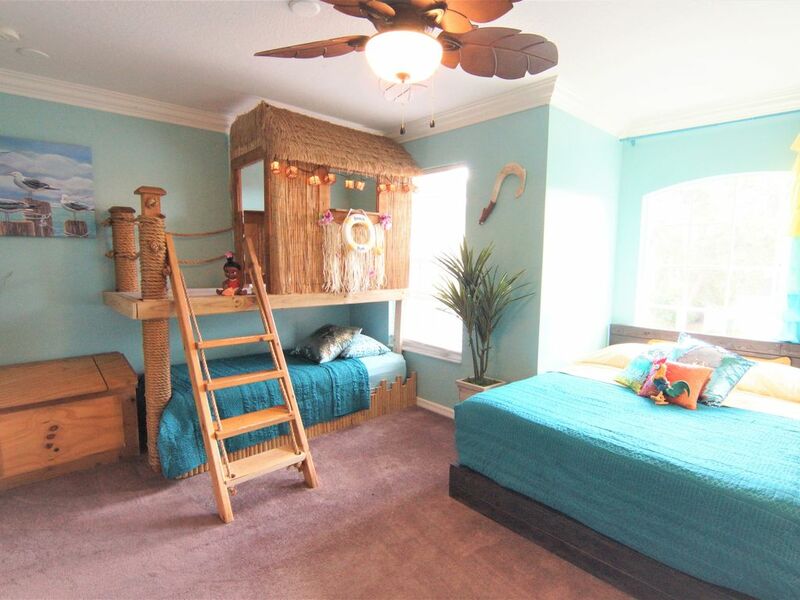 Boys and girls of all ages will LOVE this fun playhouse and breathtakingly beautiful bedroom! 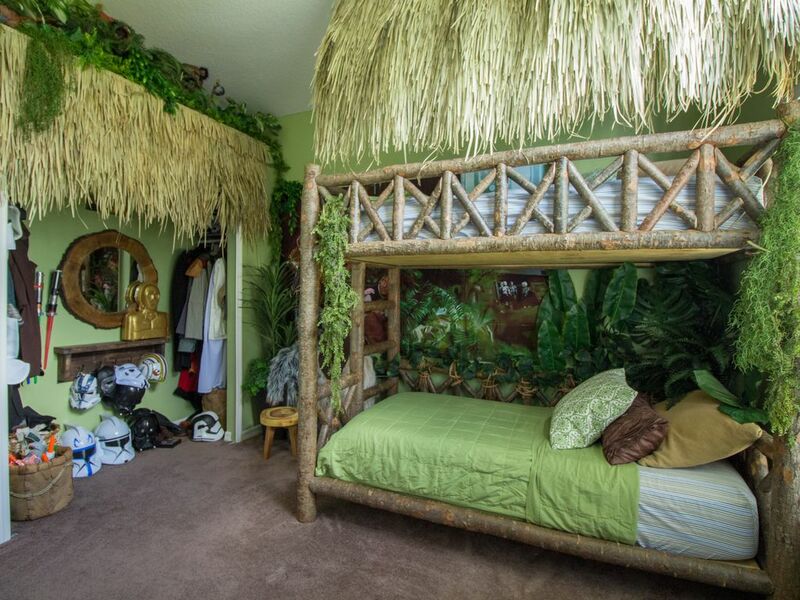 The Tiki house is decked over a twin-sized bed underneath. Moana's ship (Queen-sized bed) sails across the untamed Ocean, in search of the goddess Te Fiti. This room has been fittingly called the "vacation room" of the house by some of our small guests! Come, enter this dreamy paradise! 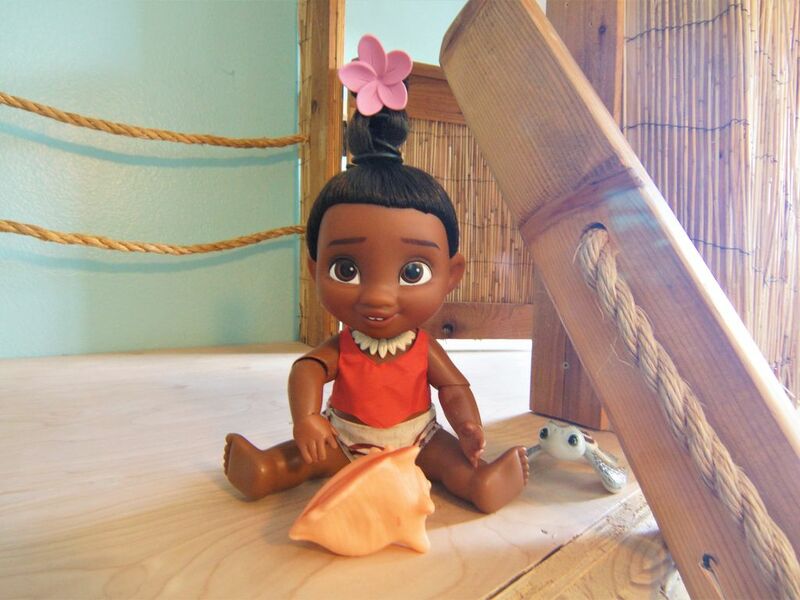 Besides the many themed toys, inside our dress-ups closet, you will find both Maui and Moana costumes for kids under age 10, including Maui's hook and Moana's oar. 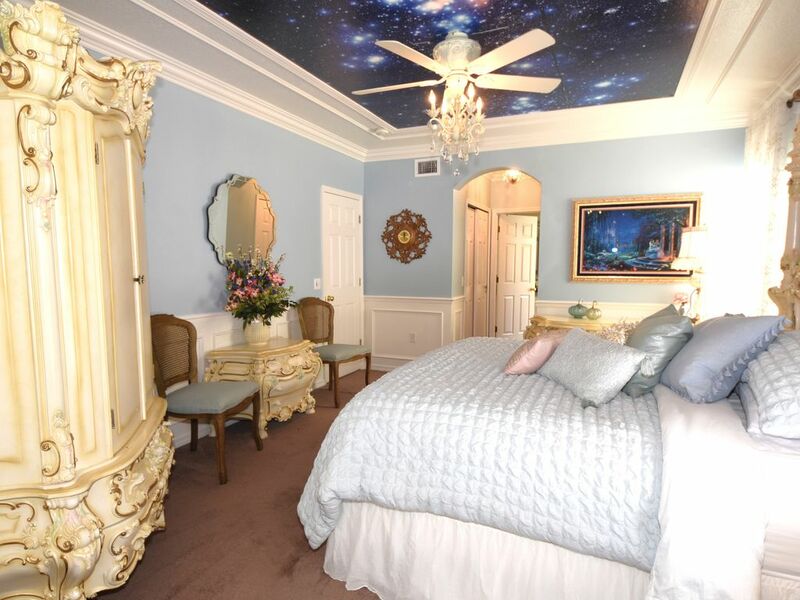 (This room has jack-n-jill/shared access to the Jasmine King Master Bathroom.) As they sing on 'Moana', ........."Happiness is where you are." 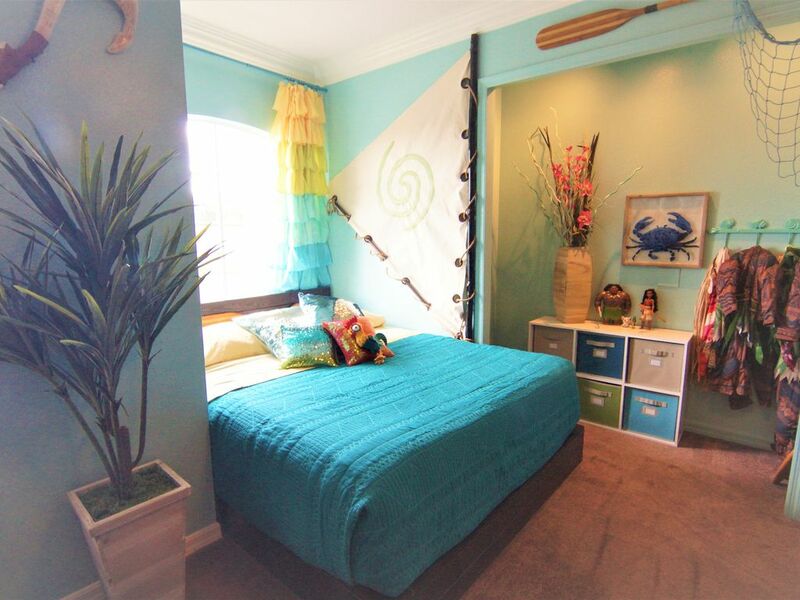 We agree, if you are so privileged that you can be in the paradise of this Polynesian fantasy room! 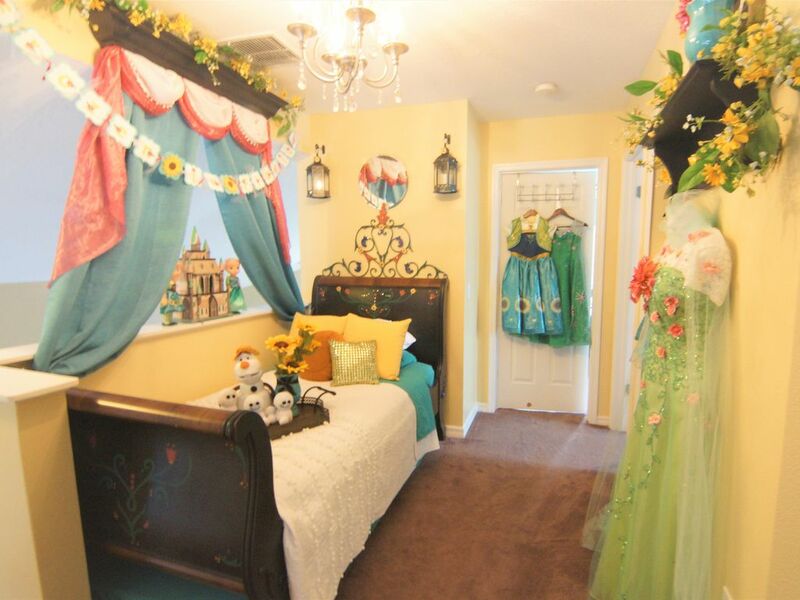 ***"FROZEN FEVER" HALLWAY/LOFT, with extra beds for sleeping Elsa or Anna, or anyone in your group, too! Sleeps 2 on a twin daybed with twin trundle underneath. 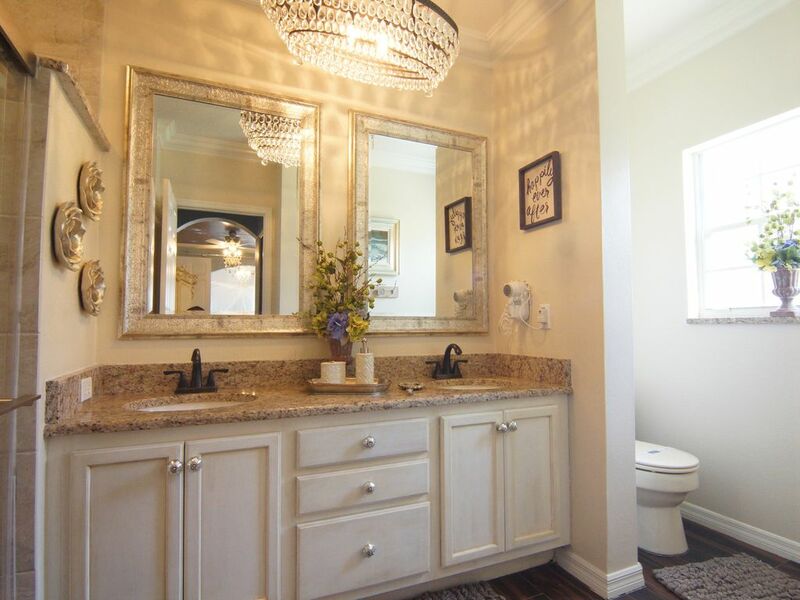 (Has optional hallway access to the Belle King Master Bathroom). 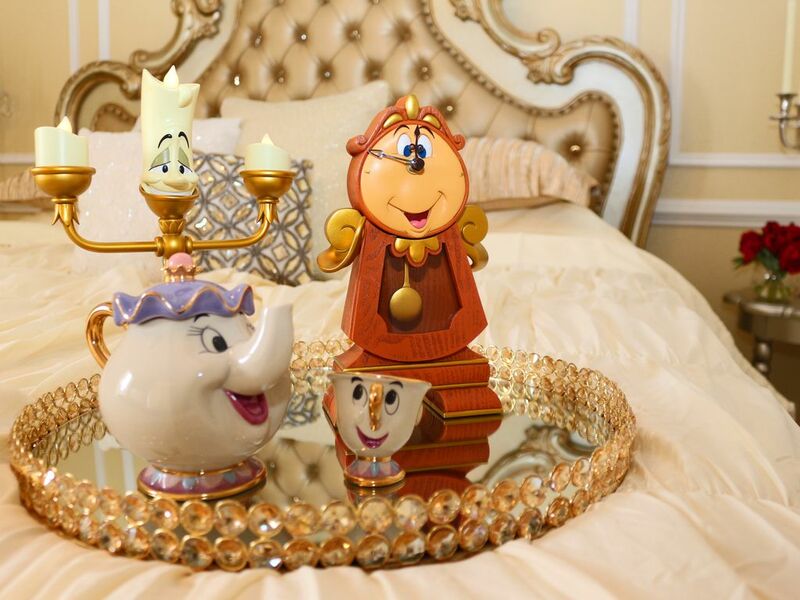 And of course, dozens of dresses, gowns and even SnowMan (Olaf) costuming with accessories! 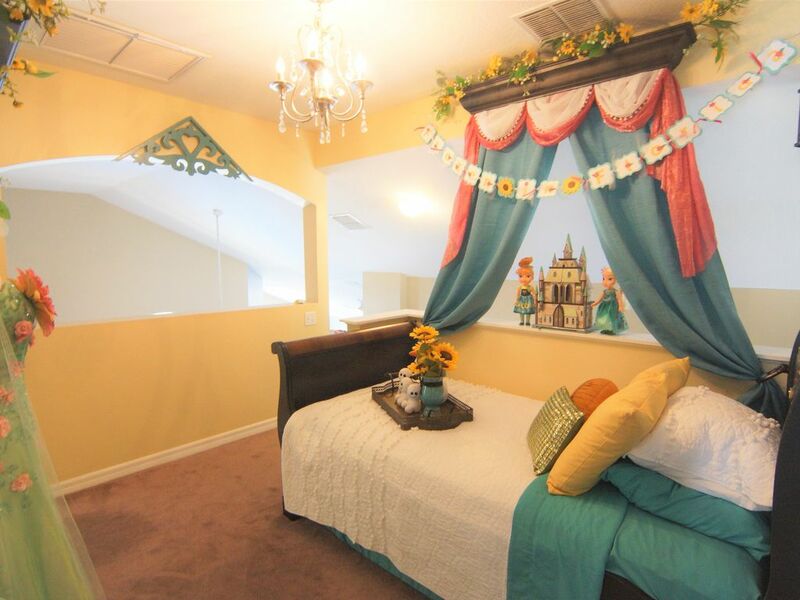 _________________________________________ 'Happily Ever After' vacation villa is equipped for 24 people, including needs for babies and young children--full size crib, Pack'n Play, 2 singles and 1 double jogging stroller, 1 high chair and 2 dining booster chairs, Disney themed plastic tableware, etc. Most of the villa's bedrooms have white noise maker/alarm systems, enabling sleep despite time zone changes and mid-day naps. 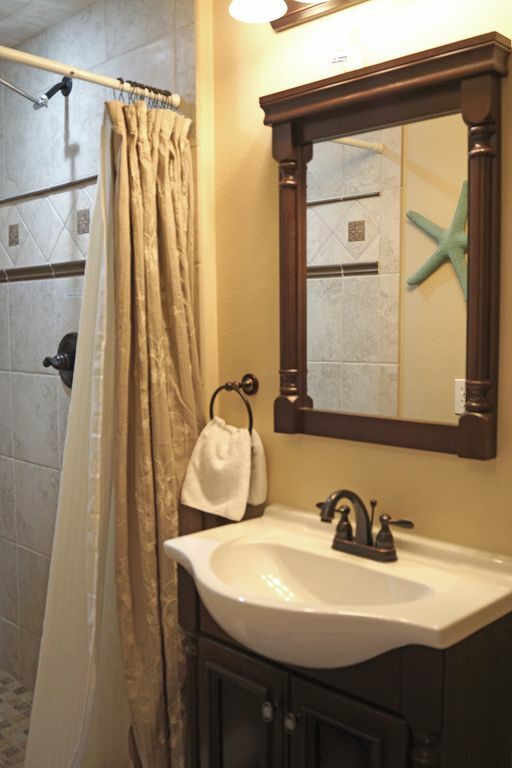 All bathrooms have hair dryers and bath towels; also stocked are separate pool/ beach towels. 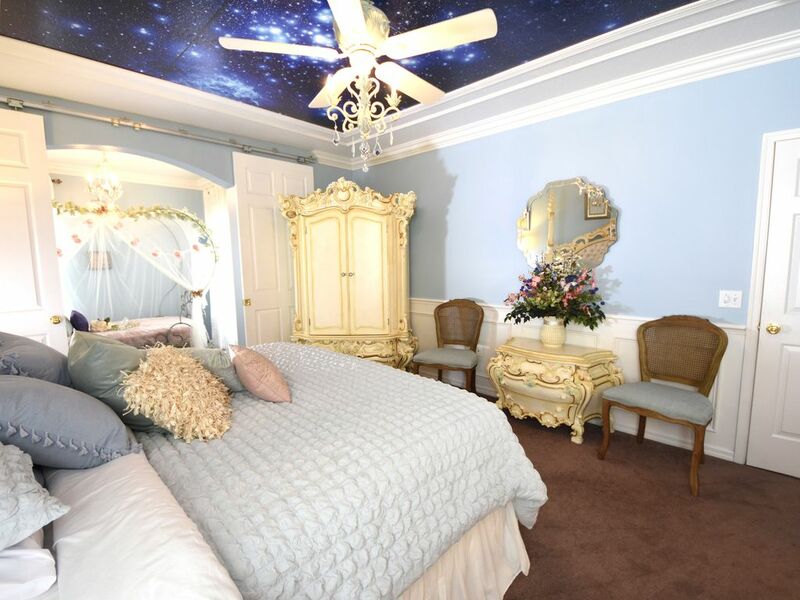 Come Stay and Play in the ultimate Luxury Disney Playhouse!!! 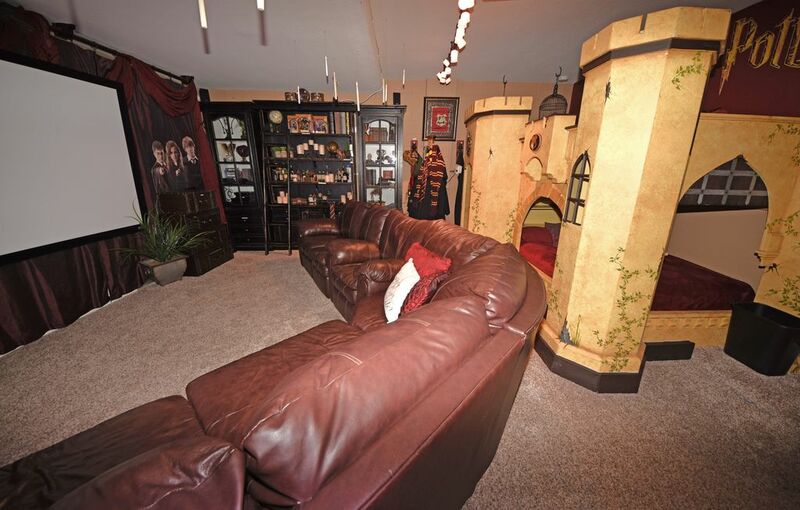 ***Please see our other 8 bedroom/5 bath "Happily Ever After" listing at vacation home rentals #477872, for gorgeous photos of our Pirates, Princess, Harry Potter, and Star Wars home theater!